Meet Me at Gunter's Tea Shop! One of the things I enjoy the most about writing a historical novel set in Regency England is researching the fascinating places that my characters might have visited. Jericho's Child: A Cozy Regency Romance was no exception, and I was so happy when my characters decided to end a hard morning of shopping with a visit to Gunter's Tea Shop. If you'd like to take a break, too, please join us for a cup of tea! Wikipedia has this to say about the famous tea shop: "[It] had its origins in a food business named "Pot and Pine Apple" started in 1757 by Italian Domenico Negri. Various English, French and Italian wet and dry sweetmeats were made and sold from the business. "In 1777 James Gunter became Negri’s business partner, and by 1799 he was the sole proprietor. In the nineteenth and twentieth centuries Gunter's became a fashionable light eatery in Mayfair, notable for its ices and sorbets. In 1815, James sent his son Robert (1783–1852) to study the confectionary trade in Paris. Robert assumed sole control of the business following his father's death in 1819, and took on his cousin John as a partner in 1837." Gunter's was famous for its ices - and the flavors were often creative. For instance this photo of Regency-inspired ices features Bergamont and Punch (front); Royal Cream, Chocolate, Burnt Filbert, and Parmesan (back). At the height of its popularity, anyone who was anyone went to Gunter's for a sweet treat. In fact, as this entry from the Encyclopedia of London tells us: "A custom grew up that the ices were eaten, not in the shop, but in the Square itself; ladies would remain in their carriages under the trees, their escorts leaning against the railings near them, while the waiters dodged across the road with their orders. For many years, when it was considered not done for a lady to be seen alone with a gentleman at a place of refreshment in the afternoon, it was perfectly respectable for them to be seen at Gunter’s Tea Shop." 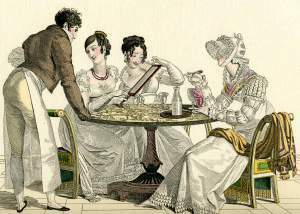 The weather was too chilly for my heroine, Sophie Moore, to eat ices outside, but as a newcomer to London, she certainly did enjoy this glimpse into the tony side of Regency life. If you'd like to taste a Regency ice, here's a recipe from 1826 for Strawberry Ice Cream. You can find the recipe in William Jarrin's book The Italian Confectioner. Jarrin, who was born in Italy, came to England in 1817 and he worked at Gunter's for a few years. He was also the author of The Epicure's Almanack (1820). William Gunter, another of James's sons, also wrote a "cookbook," the lighthearted Gunter’s Confectioner’s Oracle, published in 1830. He supposedly "told all," but in his alphabetical dictionary of raw materials, he "skipped B because it ‘is to us an empty letter.’ C was a fourteen-page treatise on coffee, in French … The dictionary skipped D and E. The letter F was for flour. Then Gunter wrote, ‘I now skip a number of useless letters until I arrive at P.” – Of Sugars and Snow: A history of ice-cream making, Jeri Quinzio, University of California Press, 2009, p. 65. Alas, Gunter's Tea Shop no longer exists. But you can pay a virtual visit to the tea shop in my Cozy Regency Romance Jericho's Child. It's available as both an ebook and paperback at Amazon.com. One of the joys of reading fiction is meeting all sorts of interesting, fun characters. But before I introduce you to the heroine of my new Cozy Regency Romance, Jericho’s Child, I’d first like to say thanks to D.B. Schaefer for inviting me to be part of the “Meet My Character” blog hop. D.B. is the author of Me & Georgette, a quirky time-travel homage to Georgette Heyer, the famed Regency historical fiction writer. Me & Georgette is her first novel, and you can find out more about it at her website. Now, I hope you’ve brought along your calling card, because the introductions are about to begin. What is the name of your character? Is she fictional or historical? Sophie Moore is the name of my heroine. She is fictional, but I’ve enjoyed her company so much that I wish she were real! The story takes place in March of 1814, in the swank Mayfair neighborhood of Regency London. Why am I being so specific about the date? The winter of 1814 was one of the coldest on record in England. The cold lasted into the spring—and I liked the fact that the cold weather outside mirrored the chilly reception that Sophie Moore receives when she arrives in London. Many years earlier, Sophie’s father saved the life of Sir Charles Wentworth. Sir Charles, a widower, now repays the favor by offering Sophie a temporary place to live in London. But Miss Dorothea Wentworth, the sister of Sir Charles and his housekeeper, has no intention of letting Sophie be treated like one of the family. Indeed, during their chilly first meeting, she warns Sophie not to set her cap at Arthur Wentworth, the eldest son and heir of the very wealthy Sir Charles. But what’s a Regency girl to do—especially when Arthur Wentworth is the perfect Regency gentleman? Sophie might not have a fortune, but she was raised by her father to be both honest and honorable. Thus, when confronted with a rival for Arthur’s love who believes that “all’s fair in love and war,” Sophie is in a quandary. Can she win Arthur and retain her integrity and self-respect? How can we read more about it? 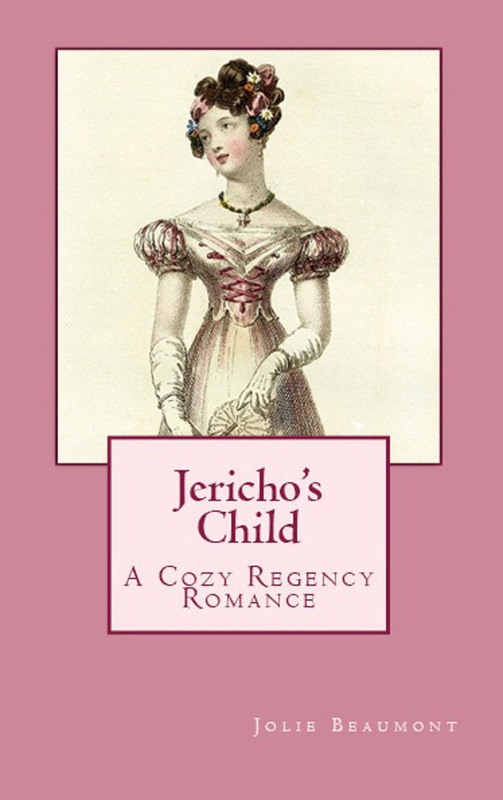 The official on-sale date for Jericho’s Child: A Cozy Regency Romance is September 18, 2014, but it can be pre-ordered now over at Amazon.com. Thanks for stopping by, and do feel free to leave a comment.